Wishing Stacie a happy 33rd birthday filled with love and joy. We look forward to another live performance! Wishing everyone a Merry Christmas from StacieOrrico.com! Stacie's 'Reunite CCM' performances - all here for you to watch! Reunite CCM concert featuring Stacie begins NOW - watch the Livestream here. Disappointed (like me!) you couldn't attend tonight's 'Reunite CCM' concert, featuring Stacie Orrico's return to the stage? Don't fear! Luminate Church is LIVE STREAMING the concert for you to enjoy - watch below and sing along from the comfort of your home. Stacie Orrico returns! Buy your tickets now! Stacie Orrico has returned! Stacie left a teaser message on her Instagram, and then moments later followed up with an announcement of her return to the stage. Book your tickets to see Stacie Orrico live here - reuniteccm.eventbrite.com. Be quick, tickets WILL sell out! And if you are an international fan, don't fret, this is only the beginning! Stacie parties with Rachael Lampa and Crystal Lewis! + Stacie Song Poll! Singer Crystal Lewis posted some fun snaps of Stacie with good mate Rachael Lampa, posing in some cute photos - check it out on Crystal Lewis's Instagram page -https://www.instagram.com/thecrystallewis/. Meanwhile, head over to our Facebook page as we peg all of Stacie's songs up against each other, to see which comes out on top as the ultimate fan favourite! Take part now! So Stacie has a new home - stacieorrico.com! Hi all! 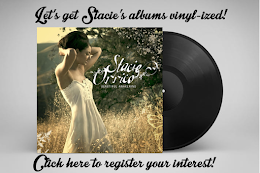 We are pleased to let you know that So Stacie now has a new home - stacieorrico.com! We hope to provide you with all Stacie-related news that comes our way. Keep those messages of support coming to Stacie through her social media platforms, and hopefully we will hear new music from our beautiful awakener soon! Long time, no see (as usual!). Whilst Stacie continues to enjoy her indefinite hiatus from releasing music, rapper Azealia Banks has shared that her upcoming album 'Fantasea 2: The Second Wave', is greatly inspired by Stacie Orrico, in particular her 2nd, self-titled 2003 release. We are very interested to see what Azealia has in store, and also have our fingers crossed that, as always, we will hear from our very own Ms. Orrico again soon..! Stacie is looking absolutely radiant, and I absolutely cannot wait to see what's in store this year! Contact 'So Stacie' at staciesbday@gmail.com. Simple theme. Powered by Blogger.